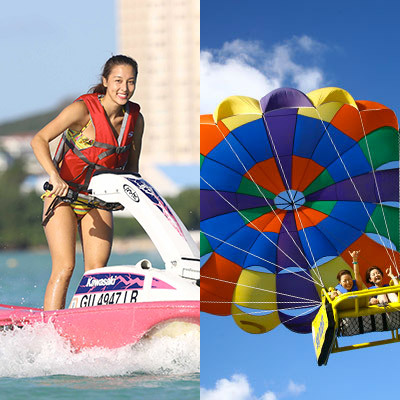 Guam’s safest and best Parasailing tour! You will launch from the deck of our specifically designed Parasail boats! You will be incredibly comfortable in our unique Sky rider Aerial Recliner system. The Aerial Recliner system provides you an incredible and breathtaking view of Guam. 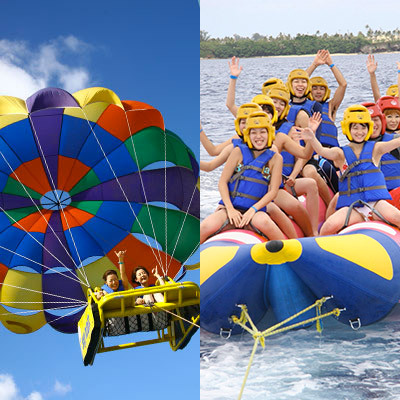 ABC’s parasailing tour will lift you 30 to 50 meters above the beautiful blue ocean. You will be able to see up and down the amazing coastline of Guam’s western coast. Most days your view will encompass Hagatna which is Guam’s capitol. Since you will be riding our Recliner system, two people can comfortably enjoy the view while having a chat! Don’t forget, ABC has the reputation for the safest flying record. ABC’s super comfortable double seat recliner system. ABC is licensed for this unique Aerial Recliner system, and we are the only company on Guam and the Marianas that uses this system. There is a consistent sense of stability from take-off to landing. 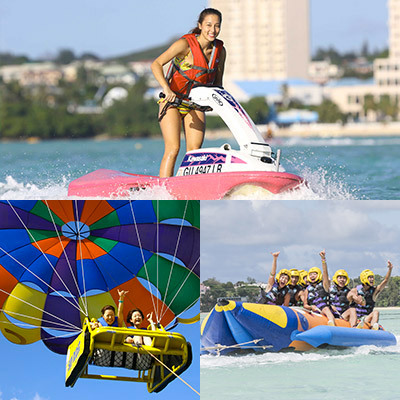 Since our founding in 1987, ABC through its Parasailing Tours has become Guam’s leader in marine sports, and we are proud to share with you a Parasailing Tour that has made ABC so successful. 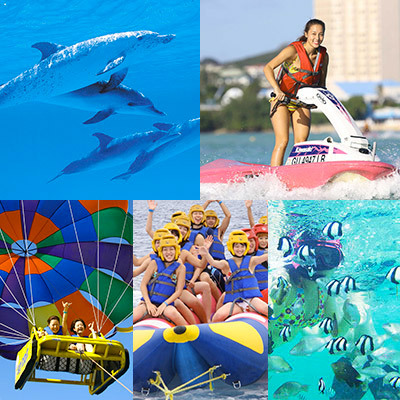 Children ages 5 and under cannot ride the parasail boat.A parent or guardian must accompany children at all times split scheduling and/or change may occur. From the rear of the boat to the sky in one movement. The amazing feeling of floating in the air is incomparable! You can enjoy the scenery and have a leisurely chat. 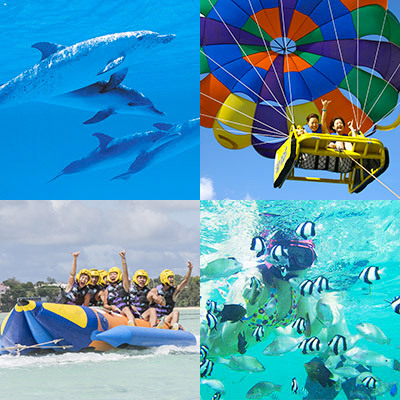 Depending on how big you are and the availability of the special chair, parasailing with three people may also available. Are you a little bit older, but want to have an adventure? No problem, the elderly will have a great time because the activity is not strenuous. The chair is designed as a recliner, so it provides you with a comfortable, safe and stable feeling! 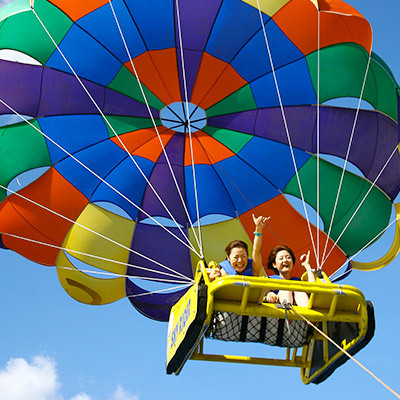 You can parasail through Guam’s cool crisp air while hearing nothing but the breeze. It is truly an unforgettable experience. Based upon the strength and direction of the wind on the tour day, the boat captain will choose the size of the best parasail parachute. The start time may change depending on the season and the weather. Children ages 6 and older and at least 1 meter tall may participate when accompanied by a guardian. Please be informed that this will be subject to the judgment of the captain, and only on days when the weather permits. In the event of inclement weather, the tour may be interrupted, delayed or canceled. You may bring a camera, sunglasses, mobile phone, etc. However, since you may be splashed with ocean spray, please bring these items at your own risk. There is no space to store belongings on the boat. Please meet at the 2nd floor deck area in front of the Gift Shop 5 to 10 minutes before the tour time. You will board ABC’s iconic pink bus and go to the Agana boat basin which is about 5 minutes away! 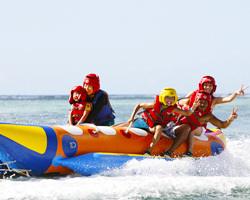 Board the boat and depart from our Agana Boat Basin! After the Captain and crew brief you, you will be given a life jacket. Enjoy cruising for about 10 to 15 minutes while chatting with the friendly staff! When the captain reaches the point where he wants to start, he will open the parasail and begin loading our guests onto the Recliner system. Once you are seated, the captain will slowly increase speed so the line gets longer until you are 30 – 50 meters in the air! Enjoy!!! The winch will pull you back to the boat safely. The staff will kindly assist you out of the chair, please watch your step and always hold on to something on the boat. Return to the dock, board the bus and return to ABC. Please wear beach shoes that are provided to you at ABC’s beach resort. Towels and a change of clothes should be left in your locker. Also, because the bus transfer is about 5 minutes, there is no need for any additional items or clothing. If you are feeling sick or can get seasick, please stop by our Gift Shop to take Motion Sickness medicine. You may bring a camera, sunglasses, mobile phone, etc. However, since you may be splashed with ocean spray, please bring these items at your own risk. There is no space to store belongings on the boat. ABC uses our patented Aerial Recliner system, so it is incredibly comfortable. Unlike the harness type Parasailing that can be uncomfortable, ABC’s Parasailing tours allow you enjoy the view in comfort. How many people can ride one boat? On most days, 12 people may ride the boat. I can not swim, is it still OK for me to participate in this activity? Yes, you can participate! At no point on this tour will you be getting off of the boat and into the water. Additionally, all of our guests must wear a life jacket on the boat.